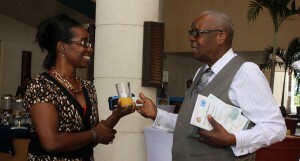 Former Prime Minister Sir Lloyd Sandiford with NUPW’s Margo Bannister. The world cannot said to be sustainable if small island developing states are not and furthermore, private/public sector partnerships can go a long way to helping achieve this for small economies. This was among observations from Secretary General of the SIDS Conference, Wu Hongbo, as he addressed a forum this morning at the three-day event in Barbados on the topic Fostering Private Sector Partnerships for SIDS. “Promoting regional enabling environments for SMEs is a particularly vital part of a private sector engagement. It bolsters the social and economic development of the SIDS,” Wu said, adding that such SMEs wove themselves into the fabric of society providing jobs, social coherence and vibrancy for the communities they inhabit. Telling leaders at the high-level meeting that the decisions made would affect their societies for decades to come, the Secretary General further advised that countries could also adopt and implement cleaner production technologies and a greener value change, while playing a leading role in providing employment opportunities. 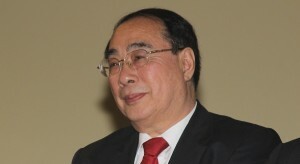 Secretary General of the SIDS Conference, Wu Hongbo. Noting that it was often said the world could not be said to be sustainable if SIDS were not, Wu said the conference could be the launch pad for new private/public partnerships with small- and medium-sized enterprises, as well as serve to strengthen existing partnerships. “These partnerships will help SIDS tackle vulnerabilities… In this undertaking, regional entities will also be key to creating the fertile ground to foster the initiation and growth of SMEs; and the private sector companies from the north can work in concert with their SIDS counterparts on a range of business interests in efforts to diversify SIDS economies. These partnerships will be mutually beneficial, and for that reason, durable.